A great barbecue sauce is a really a matter of opinion – and opinions run high – which is why it comes in so many varieties. In fact, different regions of the country typically have their own favorite version of barbecue sauce that highlights that region’s particular taste preferences – whether sweet or vinegary, runny or thick, or some variation in between. Personally, we enjoy a Southern-style sweet-n-tangy sauce with rich molasses undertones and just a slight nuance of kick. I’ve shared our favorite BBQ sauce recipe below, incase you’d like to give it a try this summer. However, if you prefer a more tomato-based Kansas-style sauce, my friend Diana developed a real food version that’s especially delicious. Whichever sauce you choose, let me share a few secrets with you for foolproof BBQ chicken that will turn your next backyard barbecue into a deliciously memorable event that will have your family and friends begging for more! 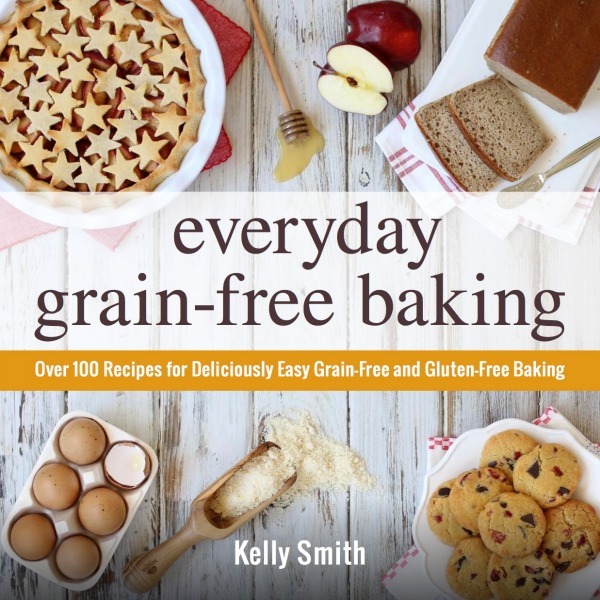 • Consider a rub – Most BBQ gurus recommend seasoning chicken pieces with a tasty spice rub prior to grilling. Think of it as layering flavors. The result is an amazingly delicious depth of flavor. You can use any number of spice rubs, but our personal favorite is to sprinkle on a little bam. Trust me, a little goes a long way! Then, allow the chicken to sit at room temp, while you preheat the grill as described below. • Preheat – When it comes to any kind of cooking, preheating is key and grilling is no different. Preheating your grill at least 10-15 minutes before cooking is vital to getting a good sear. This not only helps to prevent sticking, but even more important, results in a more flavorful and moist outcome. • Indirect heat – Cooking bone-in chicken over indirect heat rather than an open flame results in moister, more tender chicken. Indirect heat is also crucial when it comes to ensuring that your sauce caramelizes rather than burns. If using a gas grill, turn on just one side of the grill to high. Allow the grill to preheat 10-15 minutes and then place your favorite bone-in chicken pieces (drumsticks, thighs or breasts) on the opposite side of the grill (not over the flames). Cover and allow the chicken pieces to cook until they start to turn golden brown (about 20-25 minutes), making sure to follow the tip below. • Even heat – Movement is key to ensure all of the chicken cooks evenly. So make sure to switch the pieces halfway through the cook time so that the ones closer to the flames trade places with the pieces that are furthest from the flames. This will ensure all pieces are equally cooked. • Bring on the sauce – Once the chicken is golden and near done, move the pieces closer to the flames and start brushing the sauce on, making sure to turn the chicken often. It’s important at this point to remain stationed at the grill – brushing, turning, and moving the pieces around. Giving the final stage your full focus will ensure everything cooks evenly and is thoroughly covered in a perfectly caramelized sauce. • Ready to Eat! Once the chicken’s internal temp reads 165°F, remove the pieces from the grill and place them on a serving platter. Tent with foil and allow the chicken to rest about 5 minutes. Then serve and enjoy some finger-licking good barbecue! That gorgeous Citrus Salad sure looks good, hey? You can find the recipe here. 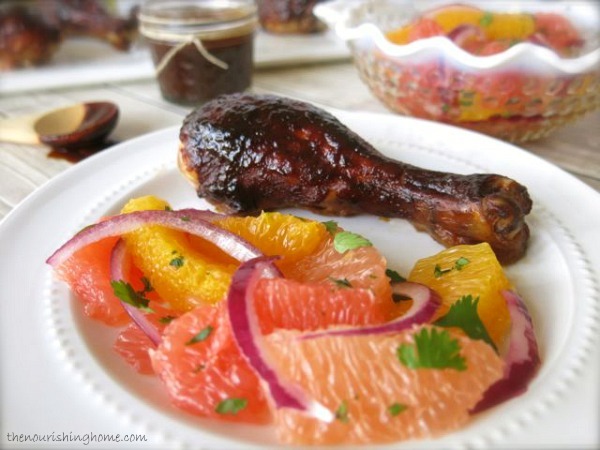 It makes a delicious sweet-n-tangy addition to any summer barbecue! In a small bowl, whisk together the ketchup, molasses, vinegar, Worcestershire, mustard, salt and pepper until well combined. Set aside. In a skillet over medium heat, add olive oil, onion and garlic. Cook until onion begins to soften, about 2-3 minutes. Then add thyme, chili powder and cayenne pepper cooking. Stir until well blended. Whisk in the ketchup mixture. Bring sauce to a gentle simmer (once it begins to simmer, you may need to reduce heat to medium-low to maintain a gentle simmer). Allow sauce to simmer for 5-8 minutes. It will thick a bit as it cooks. Then, remove from heat and allow to cool completely. Transfer to a small bowl or a mason jar. Cover and store in refrigerator until ready to use. Sauce may be kept in fridge for up to a week, or store in an airtight freezer-safe container in the freezer for up to a month. Thaw in fridge overnight when ready to use. Disclosure: The above recipe ingredient links are amazon affiliate links. By purchasing via these links The Nourishing Home receives a small percentage of the sale at no additional cost to you. Of course, you are not obligated to use these links to make a purchase, but if you do, please know that it helps to support this site and ministry. Thank you! The BBQ sauce is looking so yummy and delicious..Cannot wait to show my hubby it . I do have a question on the first two ingredients: the molasses and the apple cider vinegar..
Could they be found in stores like Whole Foods or in the organic isle in the supermarket! 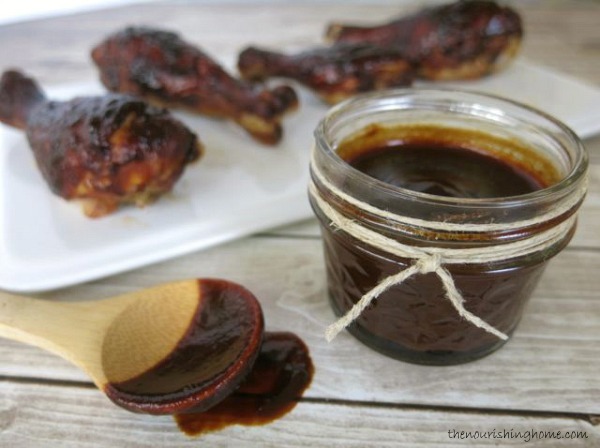 When I try to pin this BBQ sauce recipe it doesn’t load a picture on my end. Do you know how I add a picture so I can pin this page? H, Nicole. Sorry for the problem, it appears there is a conflict between two plug-ins. If you hover over the actual photo with your mouse pointer, you should see a little “Pin It” button appear. Click on that button instead and it should give you the image. We’re trying to fix the little red P button, but it may take some time to figure out the issue. 🙂 Thank you! Do you think brushing the sauce on while the chicken is on the grill is better than marinating it beforehand? Hi, Katherine. Using a marinade is fine, but what you don’t want to do is put the BBQ sauce on the chicken before it’s nearly cooked through. Reason is the sugars in BBQ sauce burn easily. So if you put BBQ sauce on raw chicken and toss on the grill, the sauce will burn before the chicken is cooked through. 🙂 Hope that helps to better clarify! Happy Summer! I haven’t found a “clean” Worcestershire sauce anywhere, may I ask what kind you use?